At the beginning of May I spent some time at the Cornwall International Male Voice Choral Festival, a massive affair with 70 choirs at 60 events in 50 venues all over Cornwall, packed into a long Bank Holiday Weekend. The mastermind behind this well-organised event was Festival Director Peter Davies, director of the Huntingdon Male Voice Choir. Over the 25 years or so that I’ve known him, he has worked hard, alongside many other colleagues, to encourage the development of the male voice choir tradition into a vibrant and forward-looking movement with a range of choirs, styles and approaches, with a wide appeal. He has commissioned a variety of new pieces for male voice choirs (including some from me), and has lobbied publishers and promoters tirelessly on behalf of the male voice choir movement. Thirty years ago, such a festival would consist of a number of rather similar looking choirs, gentlemen of a certain age with matching blazers and ties, singing, from memory, largely homophonic (chordal) music, often inspired by hymn-tunes or folk-songs, and attempting a wide dynamic range, from a whisper to a rousing forte, with varying tonal control. Last week, in the two concerts and the competition that I attended I could still hear that tradition – but as well there was a flourishing youth presence, with choirs not only from all over the UK but from St Petersburg, and adult choirs from a similarly wide range of places including Estonia and the Czech Republic. And the style of music, too, was much more varied. There were some traditional male voice choirs, from Cornwall, Wales, and elsewhere, fervently singing the classic music of their genre with excellent blend, communication, and wide dynamic range, but alongside that there were jaunty barbershop choirs, small ensembles that skilfully combined comedy with artistic and characterful singing, boys choirs singing a good range of arrangements and original songs with great stage presence, and – the main reason I was there – Cambiata Choirs. If you’ve not come across this rather odd term, a cambiata choir is for adolescent boys whose voices are changing (we don’t refer to ‘breaking voices’ any more) – and they are designed to encourage teenagers to keep singing by performing music which has been specially arranged or written for them. 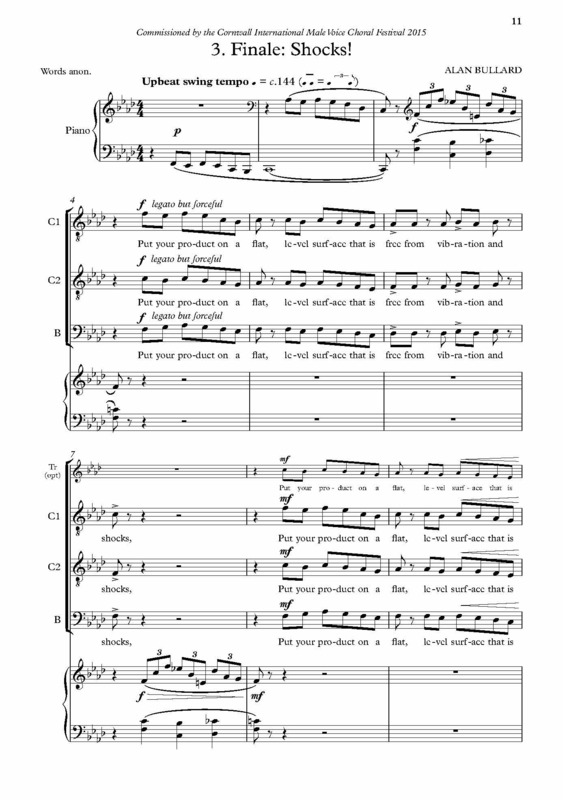 There has been much research into this in the US and the UK (for example by Martin Ashley, author of the recent book Singing in the Lower Secondary School published by OUP) and a standard format for cambiata pieces is developing, written in several parts, each of which cover a quite narrow but overlapping pitch range, so that voices are not strained or over-stretched at this important point in their development. Although, of course, there have always been choirs involving this age-range, those with changing voices have tended to be sidelined, and this movement is designed to put such voices centre stage. I was privileged to be offered this year’s Festival commission – and it, was, for the first time, to be for cambiata choir. My initial difficulty was to find an appropriate text – a recurring concern for the choral composer, but for teenage boys in particular there are many no-go areas! So I hit on the idea of those many warning notices to be found – on packaged food, children’s toys, railway trains, and on the instructions that came with my new printer! And thus my suite of three short songs, for cambiata choir and piano, was born – entitled Health and Safety. The first performance of Health and Safety was given by the excellent Warwickshire County Male Voices, conductor Garry Jones, on May 3 in the Hall for Cornwall, Truro, forming the finale of a wonderful concert of young men singers from all over the country. My thanks go to the performers, and to the Cornwall International Male Voice Choral Festival for this initiative in encouraging teenage boys to sing. Let’s hope that many more cambiata choirs will develop in the future, and that more music is written and arranged for them. The next Festival, in 2017, will be directed by Rob Elliott, as Peter Davies, the Festival Director for many years, moves on to pastures new. But whatever Peter does next, I’m sure there will be some connection with choral singing! This entry was posted in Uncategorized and tagged choral music, cimvcf, male voice choirs on May 9, 2015 by alanbullard.